The Library’s mission is to express the social and cultural foundations of the Town and to play a leadership role in building collaborations and networks. Its roles are to serve the residents as a community center, a learning place for children, and a source of life-long learning and popular materials for all residents. The following were identified as Goals in the 2016-2022 Strategic Plan. Goal 1: The Beacon Falls Public Library is the center of the community, building connections, developing partnerships, and fostering collaborations. Objective 1.A: Open a new joint library and community center building by June 30, 2021. Objective 1.B: Actively participate with a variety of town boards, commissions, organizations, and businesses to further develop resources, services and programs. Objective 1.C: Collaborate with other organizations to host a minimum of 30 co-sponsored programs each year. Goal 2: The Beacon Falls Public Library communicates effectively with the community and within the library. Objective 2.A: Share information on a face-to-face basis with community members. Objective 2.B. Provide information on library services and programs to the community in a variety of formats and media. Objective 2.C: Provide clear directions for the location of library, its materials, and its hours. 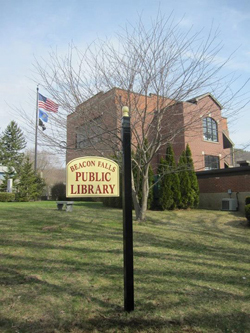 Goal 3: The Beacon Falls Public Library offers safe, welcoming, and accessible physical and virtual spaces for the community, collection and staff. Objective 3.A. Implement realistic and economically feasible recommendations from the ADA checklist survey (See Appendix B). Objective 3.B. Ensure that the new library / community center building is accessible to all. Objective 3.C. Ensure that online resources provided by the library are easy to use and accessible to all. Objective 3.D. Offer visual pleasing spaces within the existing library and hallway. Objective 3.E. Ensure that the new Library/Community Center includes a variety of spaces for community members to gather. Objective 3.F. Ensure that staff works in a safe and healthy environment. Goal 4: The Beacon Falls Public Library offers materials, programs and services that meet the needs of the community. Objective 4.A Offer a wide variety of adult programs that allow attendees to learn new skills, participate in new activities, and meet new people. Objective 4.B. Improve/Expand early literacy materials and services for preschool children and their parents. Objective 4.C. Offer additional STEAM activities for children. Objective 4.D: Expand training opportunities to increase patron’s ability to use computers and other electronic devices and software. Objective 4.E. Ensure the existing library resources meet the needs of the community. You are invited to attend the regular meeting of the Library Board of Trustees on the second Wednesday of each month at 7:00 PM (except July/August). Library Board Policies are available here for your review. A brief history of the Beacon Falls Public Library is available here.